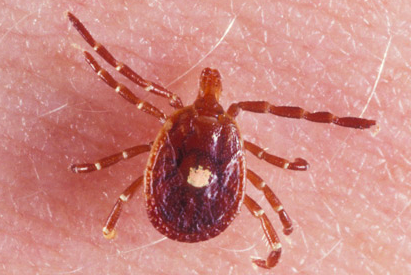 Panic over a spreading species of tick whose bite can induce a severe allergic reaction to meat may be hitting home in Pennsylvania. The lone star tick, named after the distinctive white mark on the back side of adult females, prompted a slew of reports in recent weeks after researchers noted the insect's growing presence in locations outside its native territory in the southeastern United States. Allergic reactions to lone star tick bites are believed to be traceable to a protein-linked sugar known as alpha-galactose, whose absence in human beings leaves them genetically vulnerable to sicknesses triggered by consumption of red meat, pork and lamb. The tick's primary mammalian hosts typically carry the alpha-galactose carbohydrate, shielding them from the worst symptoms of a bite. A growing number of cases have been documented in New England in recent years as immunologists puzzle over some of the bite's extreme symptoms, from hives and vomiting to itching, swelling, cramping and even throat closure. These symptoms often have a delayed onset, while others bit by lone star ticks exhibit milder reactions or no meat allergy at all. Residents of Pennsylvania, already on high alert in a state with the highest number of Lyme disease cases, may want to be cognizant of the lone star tick in the coming summer seasons. A spokesperson for the Pennsylvania Department of Health told the Pittsburgh Tribune-Review that the tick has already been spotted in the Keystone State in recent years, but so far, there isn't enough data available to pin down how prevalent it is and where it may be concentrated. State immunologists and medical entomologists told the newspaper they have dealt with a handful of cases stemming from lone star tick bites in Pennsylvania. The challenge they face during the summer months is that it can be difficult to tell whether bites originated from out-of-state travel. Lyme disease, experts agree, remains a far more pressing problem in Pennsylvania than the lone star tick, though one doctor of internal medicine characterized the latter as "pretty legitimate" as populations expand in the northeastern part of the country. Lone star ticks are not currently monitored by the Centers for Disease Control & Prevention, which notes only that the species is "very aggressive" and potentially poses a risk to most of the eastern United States.